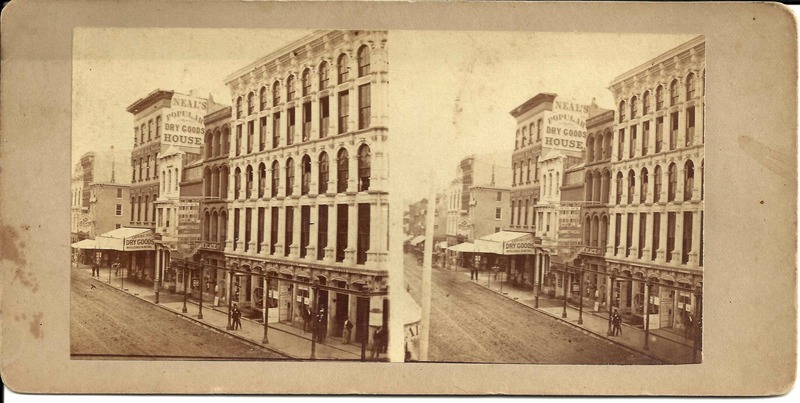 This stereoview of the 100 block of West Baltimore Street has no publisher’s or photographer’s credit. Its value lies in its depiction of a photographer’s studio and gallery. The studio skylight, and even displays of photographs in display windows, can be discerned just to the right of Neal’s Dry Goods. George H. C. Neal and Son, Dry Goods, occupied 99 and 101 West Baltimore Street at Holliday Street during the 1870s. The E. M. Cross & Co.Baltimore City Directory for 1863-1864 has an ad for George H. C. Neal’s dry goods establishment at 97 West Baltimore Street. Palmer Lenfield Perkins, “photographist,” is listed in Woods’ Baltimore Directory as early as 1858-1859 at 101 West Baltimore Street. Perkins occupied this or nearby premises, including 103 West Baltimore, through 1881 at least. Another photographer, Charles P. Lusby, occupied 103 West Baltimore in 1880. William C. Darrah’s The World of Stereographs offers a system for dating stereoviews, based on the type of mount and print. I do not have the skill and experience to date the card. The mount is relatively thin; the print surface lustrous, indicating albumen. This suggests an earlier rather than a later date. Based on the presence of Neal’s Dry Goods and directory listings for photographer P. L. Perkins, this view could have been taken as early as the 1860s. If you can help pinpoint the date of this view, please let me know. great site about baltimore photographers you have created. within my researches on palmer lenfield perkins i found your Anonymous Stereoview of West Baltimore Street Photographer’s Studio. as i am writing a book on a collection of daguerreotypes for the saarland archive, i would like to ask you if i could publish your picture by citing you in the book. Perkins is one of the photographers we own a daguerreotype from and it would be great also to show a picture of his studio. if you would agree, it would be so great to receive an email with the picture at 300dpi and the text for citing you in the book. with the great hope that you can agree. if you would agree, it would be so great to receive an email with the picture and the text for citing you in the book. I am glad you are enjoying my blog on Baltimore and Maryland photographers. I would be happy to give permission for you to use an image of this stereoview, but I must caution you that I am far from an expert and I would advise against using my conjectures as fact. His email address is images1862@yahoo.com. If you do decide you want to use an image of the stereoview on my blog, I will be happy to provide a scan.